British Prime Minister Theresa May tried to sell her Brexit withdrawal deal in a TV interview on the BBC on Sunday, roughly one week ahead of a crucial parliamentary vote on the existing withdrawal agreement. The British parliament needs to approve the withdrawal deal that May negotiated with the EU, otherwise the UK will crash out of the bloc at midnight, March 29. 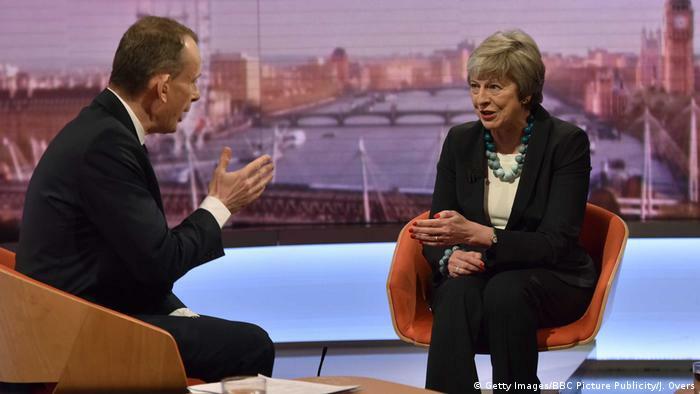 Speaking with BBC presenter Andrew Marr, May confirmed that debate would start next week on a “meaningful vote” to take place in the House of Commons around January 14 and 15. May had postponed a December vote after it became clear she lacked the support with her own conservative party to get the agreement passed. British media had speculated that May’s aides were drafting a plan to make parliamentary approval of the deal conditional upon further concession from the EU. “If the deal is not voted on [in parliament], then we are going to be in uncharted territory,” she said. “The danger there is that we end up with no Brexit at all,” May added, also dismissing calls from Brexit opponents to hold a second referendum. The prime minister defended herself against critics of her deal by asking them to provide an alternative to the plan she had negotiated. “So far, nobody has put forward an alternative on all those issues,” she said. The “backstop,” which would prevent a hard border between Northern Ireland and Ireland, has been particularly unpopular among hard-line Brexit conservatives. May detailed the measures her government would be working on in the upcoming weeks, highlighting three key areas: the border with Ireland; a greater role for the UK parliament in future negotiations with the EU; and further assurances from the EU on the terms of the future relationship. However, she underscored that the current Brexit withdrawal deal facing parliament was the only possible one. May later went back to Brussels to attempt to draw out more concessions from European negotiators, who said they will not make changes to the negotiated agreement, but said they will seek a speedy sign-off on a future free-trade deal. Earlier on Sunday, Britain’s health minister, Matt Hancock, said that he hoped chances of parliamentary approval have improved. “I certainly hope that the chances of the deal going through have improved. I think if people have gone back to their constituencies, as I have, and talked to normal people then they will have found an overwhelming sense of ‘please can we just get on with it,'” he told Sky News. He sought to reassure fears that a no-deal would result in medicine shortages, saying he was confident shortfalls wouldn’t happen if everyone does what they should. Preparations for a no-deal Brexit are ongoing in the UK, as well as in multiple European nations. Record numbers of British citizens living in EU member states have been applying for citizenship to secure their residency rights in case of a no-deal scenario.